The YOUBIQ Gymbl is a mini tripod with an all-in-one comfortable grip, tripod and tripod adapter, for capturing images. At the heart of the Gymbl is a gimbal, a pivoting, panoramic head that lets the user rotate the iPhone 4 around its optical center. The Gymbl can serve as a handheld grip to steadily and securely hold the camera in any position, or as a tripod to enable hands-free use of the iPhone 4. YOUBIQ eliminates the need to connect to a computer. The YOUBIQ App connects to the YOUBIQ Cloud, synchronizing and archiving photos in the background as they’re shot. The app can automatically share and organize photos, while preserving the originals. It registers the date and time, location, direction, and camera orientation of every image. With the YOUBIQ Cloud, media can be accessed and managed from anywhere using a standard web browser. The App allows users to capture compound images in convenient project folders using an “augmented reality” helper that help you reconstruct panoramas. The YOUBIQ App ($2.99 with 2 gigabytes of storage on the YOUBIQ Cloud) is pending approval. Once approved, it will be available for download from the iTunes Store. 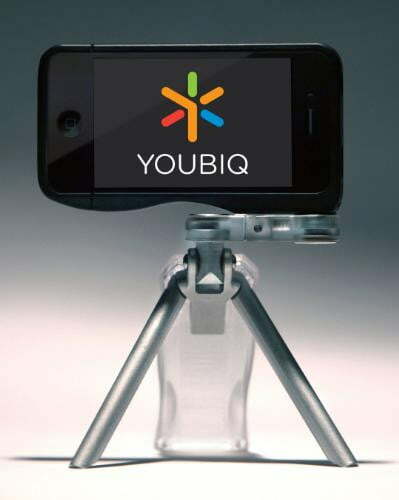 If you’re in San Francisco this week, you can check out the YOUBIQ’s tripod accessories at MacWorld. They also available for preorder at www.youbiq.com with expected delivery in early February.